It May Still Be Winter, But It’s Never Too Early to Think about AC Care! | Fresh Air, L.P. This is a common question we get, and the short answer is… well, you could, but you’d be disappointed in the results. When it comes to getting routine maintenance done, you’ll typically hear HVAC professionals recommend that it be done in the spring, since this is prior to the system’s heaviest period of use. However, this is less important than having the service done on an annual basis. So, yes, skipping maintenance just one year can be a mistake. The thing is, maintenance isn’t just a “luxury” service for those who have the budget for it. It’s a preventive measure you should take if you want to ensure the longevity, efficiency, and operation of your air conditioner. Skipping a tune-up puts your cooling system at a higher risk of functionality problems, and premature system breakdown. 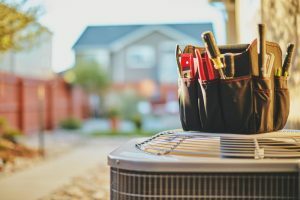 As we alluded to above, the biggest advantage of annual air conditioner maintenance is that you’ll have a system that is less likely to suffer a big operational emergency during the summer, when you need it the most. Thorough AC inspections by our highly trained and experienced staff will uncover areas where strain on the system can easily lead to breakdowns, and comprehensive cleaning helps remove potential functionality problems. The build-up of wear and tear on your air conditioner over the years causes stress on the interior components of that system. This is particularly true for the blower motor. What results from this is higher energy bills for you, as your system tries to overcome that extra strain. By keeping up on routine AC maintenance, your cooling system should retain 95% of its efficiency rating throughout its entire service life. You saw us mention longevity above—well a properly maintained air conditioner should last between 10-15 years before you need a replacement system. Annual AC inspections and tune-ups help the system give you the best return on investment by lasting as long as possible. Thorough maintenance ensures that your air conditioner will be ready for the warmer temps, and able to perform at its very best. To schedule your next air conditioning maintenance appointment in Sugar Land, TX, contact Fresh Air, L.P. today.